This is the only book on the market that covers obsolescence forecasting methodologies, including forecasting tactics for hardware and software that enable cost-effective proactive product life-cycle management. This book describes how to implement a comprehensive obsolescence management system within diverse companies. 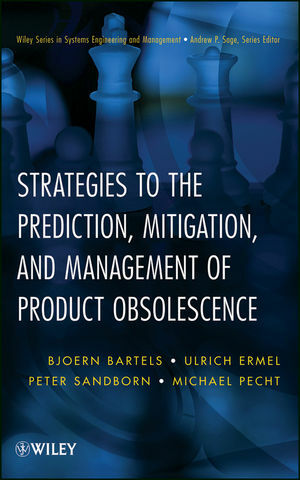 Strategies to the Prediction, Mitigation and Management of Product Obsolescence is a must-have work for all professionals in product/project management, sustainment engineering and purchasing. Bjoern Bartels is a senior consultant and obsolescence management competence lead with a masters degree in international business and a German diploma in industrial engineering and business management. Ulrich Ermel is Head of Department Materials and Obsolescence Management at TQ Systems GmbH and Chairman of the Component Obsolescence Group in Germany. Peter Sandborn, PhD, is Professor of Mechanical Engineering in the CALCE Electronic Products and Systems Center at the University of Maryland. Michael Pecht, PhD, is Chair Professor of Mechanical Engineering and Director of the Center for Advanced Life Cycle Engineering (CALCE) at the University of Maryland. He is also a visiting Professor in Electronics Engineering at City University in Hong Kong.